Custom For A Cause is a collaboration between Pride Socks and an individual to design and create a unique sock that shows off all things special to them. Together we then select a nonprofit the proceeds from the sock will go to. -Ruby Plachta is 7 years old and has all the magic inside her that will make you feel like a super star. She is already on her way to changing the world and helping everyone realize, no matter who you are, you can dream big, chase your dreams, and have them all come true. Anything is possible. 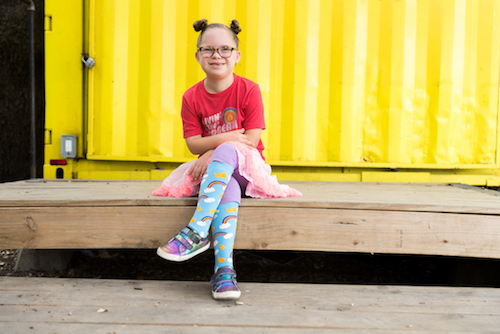 When Ruby was born, unexpectedly with Down syndrome, her parents started the nonprofit, Ruby's Rainbow and she became the face of the nonprofit. They wanted to help people like Ruby, to follow their passions and go to college. -Sky Brown is a 9 year old skate boarder from Japan. She uses her incredible skating talent to draw attention, not directly to her, but indirectly to create awareness in areas of need. While traveling in Cambodia she met a few friends. After hanging out and teaching them how to skate and boosting their morale, it did not make sense to Sky why they lived in extreme poverty. Why were her basic survival and educational needs easily met and theirs were not? Why did the kids have to walk the streets begging for money so their family could eat? It was then, Sky knew she had to do something to help make a difference in the lives of her new friends in Cambodia. It was then she wanted to work directly with ISF. -Ruby's Rainbow is a nonprofit that grants scholarships to adults with Down syndrome who are seeking post-secondary education, enrichment or vocational classes, helping them achieve their dreams of higher education while spreading awareness of their capabilities. Since 2012, they have awarded $643,000 in scholarships to over 200 adults with Down syndrome all over the country! And that number continues to grow! -ISF believes every child has the right to education, healthcare and play. Unfortunately, the most disadvantaged children in Cambodia are robbed of these rights. ISF exist to give them back. 1 in 3 Cambodian children will never finish primary school, meaning most face a life without prospects, opportunities or hope. Their Education Program focuses on children in the slums of the capital Phnom Penh whose extreme poverty mean they have never gone to school or have had to drop out. We provide them with a quality education and a real future, while working closely in their communities to lift entire families out of poverty. To purchase a pair or two of either Ruby or Sky's uniquely designed socks, click on either image. Also find more information about their unique designs.